3M. Provided the first multitrack audio recorder in 1978. M21 Editions Publisher of books, blogs and communities in order "to take part in the XXIth century metaporphoses". Maadonna. A group with Emilio Gomariz and Kim Asendorf. Give a look to their (unreadable) website. Mabel Octobre A group. Performance. Macentyre Eduardo. Artist and co-founder of the Arte Generativo (1959) movement. - Page in Artnet. Quoted by [Berger-Lioret] p. 35. Mac Guff. A company, mainly post-production. Cinema, 3D relief, commercials. Specialist of special effects. Machado Penousal Tools for artists, including aesthetic criteria, neural networs and genetic algorithms. < Evolutionary and Biologically Inspired Music, Sound, Art and Design by Penousal Machado, James McDermott, Adrian Carballal. LNCS volume 7834. Springer 2013. < Computing Aesthetics with Image Judgment Systems, by Juan Romero, Penousal Machado, Adrian Carballal and João Correia, in McCormack 2012. > Life as it could be (2008 c.) Virtual creatures. Video. > Nevar. Software, oriented towards aesthetic judgment, using neural networks and genetic algorithms. > Darwinci (2000 c.) A system for new ideas generation, using multi-domain knowledge bases, around musical and graphic structures. [Lioret] pp. 98-99. 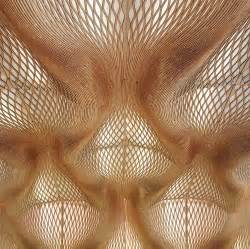 < The Art of Artificial Evolution: by Juan Romero an Penousal Machado, Natural Computing Series. Springer 2007. - Quoted by [Berger-Lioret] p. 134, 177. > Brain Opera (1996). Intervention at "Etats-Généraux de l'écriture interactive". Nov'Art no 22. Mack Heinz. Wikipedia. A kinetic artist, with mainly mirrors and a pinch of digital (says the communiqué by Denise René). Years 1950's. Somehow a predecessor of Daniel Rozin. - Show in Paris, Galerie Denise René, Sept. Oct. 2012. The communiqué. Madan Emmanuel. Music composer and sound artist. A member of The User. Madi Musée achéménide virtuel et interactif. SH No 22 (notes after the interview). > Nature (2005) Video. 6 pages with pictures in [Algora]. > Design by numbers (1999 c.). Software (DBN). > Tap (1998). Typography, writing. [Paul]. < Code création. Thames and Hudson 2004. < De la simplicité, Editions Payot, 2007. < Creative Code : Aesthetics + Computation, Thames and Hudson, 2004. > The reactive square (1994). CD Rom. In the collections of Moma (NY). - [Popper 2] p. 105, [Berger-Lioret] p. 66,177, 190. > Music Maker 17 XXL (2011). < Art, Hack, Hacktivisme, culture jamming, médias tactiques. 32 pages in [Lartigaud]. Magné Bernard. Presented at length by Bootz. > Mémoires d’un (mauvais) coucheur (1995) A combinatorial work. - Video of her reception lecture as honoris causa doctor in Ottawa University. Magruder Michael Takeo. Artist and scientist at King's Visualization Lab, King's College London. His topics : media critic, aesthetic journalism, computer aesthetics, information distribution. His website contains a lot of well commented works. Maguet Stéphane A member of Music2eye. Interactive music. 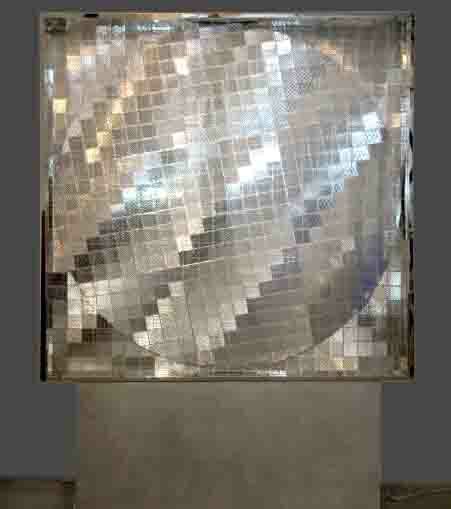 - Galerie Numeris Causa, has had a window on boulevard Beaumarchais, has no limited activities, on the web. Magyarosi Eva. See Valentina page. Video. Nicolas Maigret: The Pirate Cinema. Maigret Nicolas. See Art of Failure. > Predictive Art Bot (2017) by Nicolas Maigret and Maria Roszkowska. > The Pirate Cinema (2014). "In the context of omnipresent telecommunications surveillance, “The Pirate Cinema” makes the hidden activity and geography of Peer-to-Peer file sharing visible. The project is presented as a monitoring room, which shows Peer-to-Peer transfers happening in real time on networks using the BitTorrent protocol. 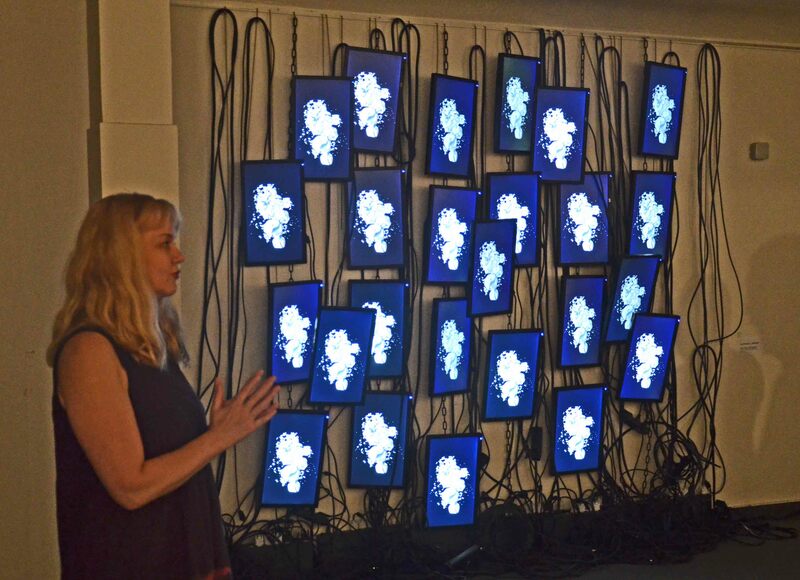 The installation produces an arbitrary cut-up of the files currently being exchanged. This immediate and fragmentary rendering of digital activity, with information concerning its source and destination, thus depicts the topology of digital media consumption and uncontrolled content dissemination in a connected world.". Dedicated page. < Théâtre de l’écriture (1986) Polyphonic text, for three voices plus a metronome. [Bootz]. > Générateur de critique d'art. Online. Maillet Emilie Anna. Theater, stage designer. Ex voto à la lune Cy. > Hiver (2012.). Digital art on a play by Jon Fosse. >Eva (2012). Film. Our post. Maire Julien. Quoted by [Berger-Lioret] p. 53. > Digit (2006). Performance. [Moulon] p. 103-104 with photo. Maleve Nicolas. Research and art, about archives, image collections. - Upgrade! in may 2012. > Maison Vole (1983). Film by André Martin et Philippe Quéau, produced by INA and Sogitec as a trailer for Imagina 1983. Paris ACM Siggraph page. Video of the film. > The empire of things (1969). 3 pages plus a color plate in [Youngblood]. "Haikuesque impressions of things observed, events remembered, nightmares experienced... the sky bursts in spectral madness". > Untitled (before 1977). See an image in Recode project. Makkuni Ranjit Wikipedia : "an international multimedia artist and designer, the director of the design think tank, the Sacred World Research Laboratory. 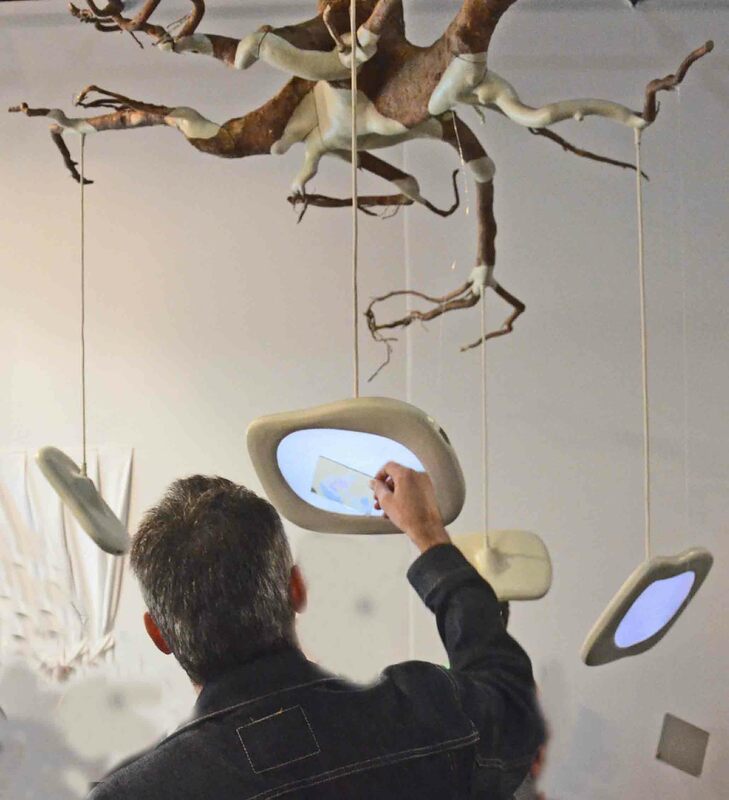 His multidimensional, multimedia museum works are intersections between traditional and modern art, design and technology, such that the results help both traditional and modern cultures. They are intended to show that the wisdom of traditional communities can positively negate the homogenizing influences of modern technology; and that the intelligence, creativity and sense of freedom afforded by modern design and technology can reciprocally help traditional > The Electronic Sketchbook of Tibetan Thangka Painting (1989). > Tapetronic . Sound processing. Malgoire Jean-Louis Ensad, Atelier d'Image et d'Informatique. Malichier Guillaume. A founder of Pixel Carré agency. Malina Frank. Wikipedia Cinema, litgths, music. En 1968, he launches the Leonardo review. - Comments in the thesis of Nick Lambert. - [Popper 1] 24 102-104 119-124. > Lumidyne, reflectodyne, polardyne (1956) System. [(Popper 2] pp. 43-46. Malina Roger A son of Frank. Manager of Leonardo. - [Popper 1] 66, 124. < L'univers est-il numérique? Intervention to Artmedia VIII symposium. 2002. AH No 97 (concepts). Judy Malloy: Uncle Roger: The Blue Notebook, Record No.39, 1986, monitor presentation (screen shot of a short film by Dene Grigar). Image and comment taken from Thomas Dreher. > Uncle Roger (1986) . Presentation in History of Computer Art, by Thomas Dreher. > Stanley and Stelly breaking the ice (1987). Produced by Symbolics Inc. and Whitney/Demos productions. In the funds of Ina. Maloney Jessica. Image and matter. > Exponential growth (2006 c.) Image (an Arizona map) + wax and wood framing. Siggraph 2006. - His ideas and the Inventaire du patrimoine français which he initiated are commented in the book of Michel Melot : Mirabilia (Gallimard 2012). < Ecrits sur l'Art. La Pléïade Gallimard 2004. Notably Le musée imaginaire (Gallimard 1965). An important text for digital art, since he shows (at large) how the diffusion of photography of art works has influenced the way we perceive them. Malstaf Lawrence. Between theater and digital visual. Mixes interaction and random. > Mirror (2002) Cited with picture in Artpress2 Art in the digital age, May-June-July 2013. > Nemo Observatorium (2002) Video . [Moulon] p. 61 wih a photo. On the borderlines of graphics and music, buts mostly music, and now on the Internet. Manac'h Erwan. Journalist. Page Facebook. Mancuso Marco. Digital art critic. See a Goethe Institute page. Mandelbrot Benoit . The father of fractals. 2010 +. < Les objets fractals. Flammarion 1975-1995. The seminal book. - Video of a debate at Parisscience 4/4/2009. - Quoted by [Berger-Lioret], on several pages. > Shop Mandiberg (2000). Work on identity modeling. [Greene]. Mandron Jérôme . Sometimes very classic, sometimes more apparently digita. Laura Mannelli: Beyond... Not to stare into bitmaps. Manetas Miltos. Painting and web. > Jackson Pollock (2005C). Visit the website and have fun ! . Mannelli Laura. Architect and installations. "She is keen on all the perceptions and concepts borne by the otion of space. With the emergence of digittal cltures, very early, she develops a pluridisciplinary approach to experiment of atopic architecture, between real and virtual. In order to study and meaure the stakes of information techologies, she co-fones in 2008, the non-profit associationa Human Atopc Space, where she develops projects going from digital installations to digital scenograpies and event design" (our translation from the website). 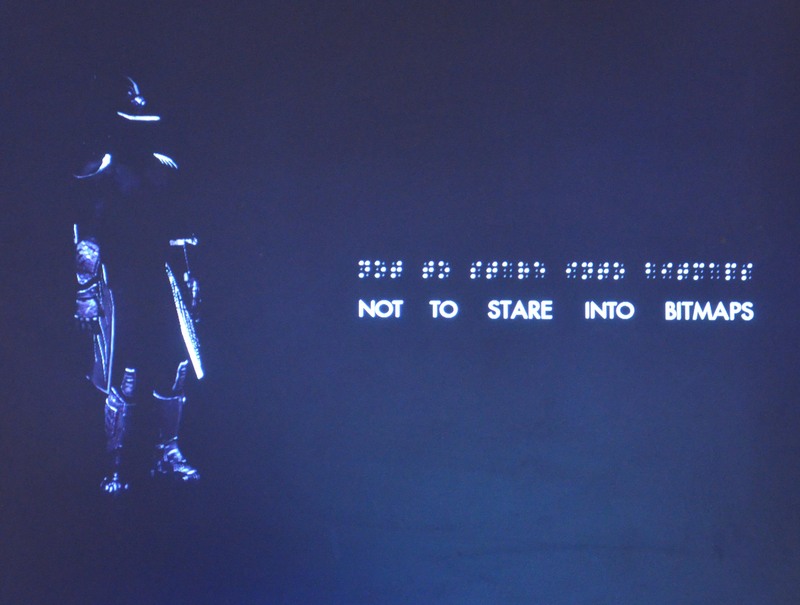 > Beyond... Not to stare into bitmaps (2014 c.). Video and installation. inspied by Snowcrash, the novel by Neil Stephenson. > AFK. Away from keyboard (2011). Mangin Benoit. Co-founder of Art Orienté Objet grouP (Bio art, but not computer based). > Wireless wearable webcam (1980). [Paul]. Mannelli Laura . Architect. Interested by all aspects of space, real or virtual. > Beyond... Not to stare into bitmap (. inspied by Snowcrash. > Werner Von Braun (1978). Print on computer with large black and white pixels. See an image in Recode project. Manolosanctis. Site for creation and distribution of comic strips. Manoury Philippe. Composer. His page in Brahms base. < La musique du temps réel. Entretiens avec Omer Corlaix et Jean-Guillaume Lebrun. Paris, Editions MF 2012. > Tensio (2011), for a string quartet "renews the real time problematics, using an electronic control by interaction between the players". (Ircam doc. our translation). > Le livre des claviers (The book of keyboards) (2009). Performance Video . < 'Opéra K... et les Nouvelles Technologies, par Mireille Boris. Veille, 2003. < The New Media Reader. Ed. by Noah Wardrip-Fruin and Nick Montfort, with introductions by Janet H. Murray and Lev Manovich (New Media from Borges to HTML). MIT Press, Cambridge Mass and London, 2003. < The language of new media. MIT Press 2001. <The death of computer art (online). Indicated by Valentina Peri. - Quoted by [Berger-Lioret] pp. 74, 181, 222. Manray Marco. See Marco Cadioli. Mantz Gerhard. Page DAM. Gerhard Mantz is one of the artists, who became interested in the computer and its possibilities, after being already established as a sculptor. He studied at the Academy of Arts in Karlsruhe from 1970-75. He now creates his objects with the computer, independently of the restraints and limitations of the physical world. These objects, based on simple geometric forms, are developed as a computer-model and then materialized in the studio. But very soon he developed his virtual images, ambivalent between nature and artificiality. In the last years he added his Infinite Image Productions. Infinite Image Productions means a series of computer animations. In these animations a program produces images in the very moment you see them. While normal films play prerecorded pictures, these animations are spontaneous and endless. Every image is unique and will never return. > The Compliment (2008) and several other works presented in [Lieser] with large pictures. Manuel Bertrand. Robotics, stage lights. A member of Orkestronika group. Marc Steven. Fractalist art. He "presents works born from an techno-artistic hybridation with image digitization sofware and algorithmic complexification of visual forms, [Chirollet] comments (our translation). Jean-Pierre Marchadour Dactylographies. On left, the device. On right, a work. .
Marchadour Jean-Pierre. Painting with a special use of a typewriter. A big magnifier is installed on the machine in order to work with maximal precision. He makes a comeback of a tradition as old as the typewriter itself, the story of which has been written by Roger Laufer ([Laufer]). 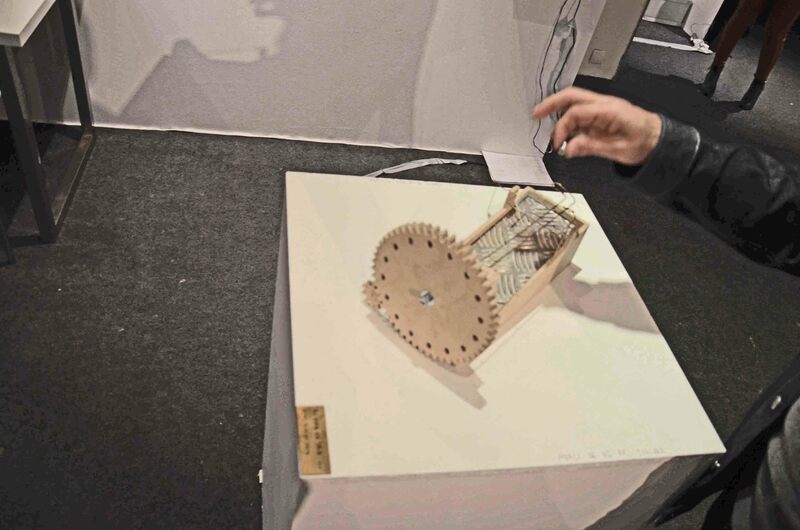 Let's note also that the typewriter inspired Sommerer and Mignonneau for a "generative" work shown in Art Karlsruhe 2012 (our report). > Dactylographies (2012). Marchal Damien. See Documents d'artistes Bretagne page. Drawings. > L'inquiétude de la raison (2013) Reasons restlessness. < When augmented reality enriches museum visit:. Lessons learned. by Anne Bationo-Tillon, Pascal Houlier and Isabelle Marchal. Orange Labs. Online. Communication at Laval Virtual 2010. Marchand Sylvie. Director, multimedia creator, in collaboration with Lionel Camburet and the artists of the Gigacircus group. - Resident in Hangar de Barcelone, end of 2012, to create Danzar o Morir. Margnac Jean-Paul. Photographer. > His biography. < Digital art in photography. A brief contribution into diccan to set out some points. Margolis Misha. Videos integrated into sculptures. > Memo (2011 c.) A global work, shown in Galerie Charlot (7/2011), with a set of envelopes. When you take one in hand, the video is displayed on the large screen. - Quoted by [Berger-Lioret] p. 81. - [Popper 1] p. 31 : "At the time of this exposition (1968), I was strongly influenced by an artist who did'nt belong go the Milano's Gruppo T, but who joined it for the show. It was Enzo Mari, a famed Italian designer, also an arist. To correspond with the new aesthetic conditions in architecture, in industrial design and even in plastic arts, he demanded that the researcher make use of programming methods with "modular" prefabricated elements, affording the spectator to make their way progressively, step after step, in the environment" (Our translation). > Sessanta fermacarte (2010 c.). Sixty paperweighs. Video (Italian text). > Isciviti al canale (2010 c. ) Video . < De la représentation. Seuil/Gallimard 1994. - Quoted notably by [Murray]. Marino Ivan. Medienkuntnetz page. Hypertextual audiovisual discourse. Typographic games. > In Death’s Dream Kingdom (2003). Marino Mark.Writing, artist and scientist. N. Marino. A gallery founded in 1998 in Paris 3d district. Dedicated to kinetic art, including some digital artists. > Mario Paint Composer (2009) Humorous software for musical composition, based on Mario. Marion Maxime. Multimedia, photograhy. See Emilie Brout et Maxime Marion. > Matériau Lumineux (2012) under Mental Ray. > Tempo (2008). Generative installation. - Chris Marker (a French video and film maker, in spite of his name and first name) is not the name to come into mind about digital art. Nevertheless, he is quoted for instance by Edmond Couchot in his book L'art numérique [Couchot 2003] for his CD-Rom Immemory, published in 1998 (he was then 77 ! 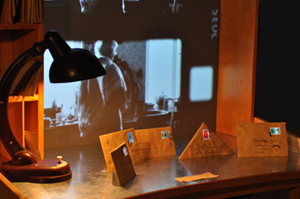 ), an interactive work which calls the spectator to an exploration of the author's memory and a large collection of documents. - Dialetor 6. (1988 c.). Interactive installation on an Apple II. Revived in 2014 by a team formed by Agnès de Cayeux, Jean-François Perret et André Lozano (aka Loz). A 4 pages article in MCD Sept-Oct-Nov 3014. - Long comments in [Murray], notably two chapters of 20 and 21 pages (the latter about Level 5). > Owls at Noon Prelude : The Hollow Men (2005). Installation. Youtube. > Immemory (1998). CD-Rom. Comments (in French) by Derives. > Level 5 (1996) (about Okinawa). Wikipedia. - Some links about Chris Marker, sent by Dominique Lacroix : Marker and INternet, Chrismarker.ch , Chrismarker.org. > Article on Allociné, 2012, indicated by Hugo Verlinde. Atelier Markgraph. Founded 1986 4 pages in [Klanten]. > Sound of the squares (2000 c.). Marko-93. Light Art. Site . Highly creative : body writing, space writing, light art. > Paris by Light (201G0 c.). "Legal light graffitis". Video. > Hara (2015C), by Guillaume Marmin and Frédéric Marolleau. Marquette Jean-Claude. Painting. Simple assembly of black and white squares. See images and code in Recode project. > Harmonic Stories (before 1976). Marsan Marie-Claire. General delegate of Comité professionnel des galeries d'art (Syndicat national des galeries d'art moderne et contemporain). > Interacive Stars (2012). Combines images taken from a camera and processed (to contours, for instance), with other shapes on background. Typically generative art. < Mainstream. Enquête sur cette culture qui plaît à tout le monde. Flammarion 2010. The work has been criticized, notably for a lack of up to date information. But it remains, as far as we know, the only one on this subject, and a fascinating trip. Martelli Bruno. Dance. Member of Igloo group. Martenot Maurice Inventor of "Martenot waves", one of the first synthesizers, with the Theremin. Quoted by [Berger-Lioret] p. 28. > Hallali (2011) with Philippe Pertigenet. > Aux quatre vents (2010). > Maison vole (1983). Film by André Martin and Philippe Quéau. Ina/Sogitec audiovisuel. Paris ACM Siggraph page. Video of the film. > Ellipsoid (1977). A picture in the Recode project. Black and white, linear. Martinache François. Painter using the computer to create, mix and remix. As output, high resolution prints, mounted on aluminum. Martinengo Alice. A founder of Pixel Carré agency. Martinez Luc. Sound designer, quoted at length in Sonovision, May 2011. < Zero Gravity Being (Etre en apesanteur), by Chu-Yin Chen and Swann Martinez. Martinez Xano. Interaction with music and images. Martinucci Maurizio. See his pseudonym TeZ. Martraire Cyrille . Musician. Author of a graphic sequencer. - Music motion, Our comments on his presentation at Gaité Lyrique, 9/2012. > Bleu Remix (2007). Performance, body art. Digital ? [Moulon] p. 110. Masao Komura. See CTG Group. < Le morphing sur votre PC. Eyrolles 1994. Massironi Eugenio. Cinetic art, 1950's. A member of Gruppo N.
- In 2014, founder and CEO of Building Conversation. - Founded the Creative Industries program at Northeastern University in Boston. Wikipedia. < CG 101. Version2. A computer graphics industry reference. Digital Fauxtography, USA, 2007. A substantial base of data, about art and industry. Strongly centered on USA feats. > Computerized Haiku (1968). Cited by [Dixon 2007]. Interaction and poetry. > Computer Reflecting Cylinder. (1978). See an image in Recode project. And of several other views. - Creator of the first music synthesizer software, in 1957, according to [Baudouin]. Jean-Marc Matos: Monster (2014, Compagnie K Danse). Matos Jean-Marc Dancer, integrating the computer into his shows (notably at Monaco Dance Forum, according to Le Monde, 12/14/2000). Founder of K. Danse company. A presentation of his works in a 1991 paper, in [artpress 2015]. 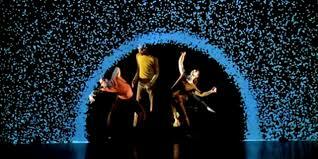 - Video of a dance show in a projected rectangle. < Current directions in computer music research. by Max Mathews and John Pierce. The MIT Press, 1989. > Continuous Line Design (before 1977). Print. See an image in Recode project. > Mattamorphose 1985-1986. Quoted by Stéphane Druais at the symposium "Le futur a un passé" (Ensad, June 2011). > Reenactment of Joseph Beuys's 7000 Oaks (2007) . [Moulon] pp. 72-73 with a photo. > Shoot, 2007-10. Reenactment of Chris Burden's Shoot. Performing in Plymouth. A picture in [Bianchini-Verhagen]. > Sonic Bed (2008) . The work has been presented at the Cube (Issy les Moulineaux, Ile-de-France) in 2011. Maubert Alexandre. Photography and cinema. > Cutting Plane Series (2013 c.) "A sort of apparent softness, childish, in contradiction with the violence of the Tsunami. That's typical of manga culture" (Dominique Moulon, our translation). > In public (2009). Video transfered on digital frame. Maubrey Benoit. Performance and scupture. > Audio Ballerinas (2006 c.) Siggraph 2006. - Video Palmares of the 35th Concours Internationaux de Musique et d’Art Sonore Electroacoustiques, Bourges (France) 2004. - Quoted by [Berger-Lioret] p. 92. Maurer Ingo. Light art. More and more digital with the years. < Ingo Maurer. Designing with Light. by Bernhardt Dessecker (ed). Prestel, Munich 2008. > Les Rêves des Diamants (1989). > Skycatcher Visualizations (2006). With Jonathan Puckey. Non photorealistic. Presentation in large format. 4 pages with pictures in [Bohnacker]. Mauro-Flude Nancy. See her Quartier 21 page. > Reflexion (2008). with Andreas Fisher . Digital sculpture. 4 pages with pictures in [Bohnacker]. > Turning a Sphere Inside Out (1976), quoted by [Masson]. Stop motion clay animation. Max/MSP. A programming language, music oriented. Wikipedia. - Similar products : Pure Data, Usine. > Cinema 4D. (2000 c.). Software "The most easy of all 3D products " (Guide Création 3D, 2010). Maya 3D creation software. See Autodesk. Mbarkho Ricardo. Image generation from texts. Also works on identity issues, notably through web. < The Apocalypse (2010). It is difficult to understant these works, in absence of explanation of text/image correspondance. 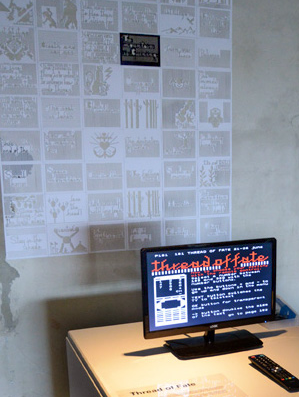 > The Pixelated Revolution (2012). Quoted with a picture by [artpress 2015]. > Multiscale Turing patterns (2010c.). See webpage. > Conversacube (2010 c.). A note in Random Magazine. > Happiness Hat (2009). Quoted with a picture by [artpress 2015]. < Faire de la bande dessinée. Delcourt 2007 (American original 2006). < L’art invisible. Delcourt 2007 (American original 1993). > The Book of Shapes (2010). Not properly digital. It is more a manual exploration of form through a collection of partial shapes. < Aaron's code. Meta-art, artificial intelligence and the work of Harold Cohen. by Pamela MacCorduck. Freeman 1991. Quoted by [Berger-Lioret] p. 65. < Impossible Nature: the art of Jon McCormack. Australian Centre for the Moving Image, 2004. - a tentative breakthrough behind the present lines by Jürgen Schmidhuber, who define beauty (shall we say in short) as the aptitude of a work to enhance our ability to cope with ulterior complex inputs. McCoy Jennifer and Kevin Interaction [Paul]. > Every Shot Every Episode (2001) [Greene]. All the shots forming the 20 episodes of Starsky and Hutch are sorted. > A constant Universe (1990 c. ). Video. MCD, Magazine des cultures digitales (ex. Musique et cultures digitales. Digital music and cultures). < Aréhéologie des média. Sept-Oct-Nov 2014. < Arts numériques, artistes, lieux et festivals. M21 Editions 2010. McDonald Kyle. "An artist who works in the open with code. He is a contributor to arts-engineering toolkits like openFrameworks, and spends a significant amount of time building tools that allow artists to use new algorithms in creative ways. His work is very process-oriented, and he has made a habit of sharing ideas and projects in public before they're completed". > Augmented Hand Series (2013), by Golan Levin, Chris Sugrue and Kyle McDonald. Quoted with a picture by [artpress 2015]. McGinity Matthew. A computer scientist specializing in immersive and interactive computer systems. McGonigal Jane.Games to save the world. < Loving Big Brother. Performance, privacy an d surveillance space. Routledge 2004. A reflection about the fact that we love to be known by computers. A theatrical inspiration. Mc Guff Paris . Cinema, 3D relief, commercials. McIntosh Thomas. Architect and installations artist. A member of The User. McIntyre Catherine. Photographer using computers only for compositing. Example analyzed in depth by Nick Lambert. McLaren Norman Cinema and sound. 1950's. One of the inspirers of Fantasia (Disney). Not digital. Images and sound are drawn directlu on film. > Lignes horizontales (1962). Experimental film. Video . < The Gutenberg Galaxy. by Marshall McLuhan. University of Toronto Press 1962. Paperbadk Signet Books 1969. < Understanding medias, by Marshall Mc Luhan Editions Routledge and Kegan Paul Limited, London 1964. - Video of an interview by Mike McManus, 5/7/2010 : regression, violence, identity. < The Galaxy Reconfigured (1962) and The Medium is the Message (1964), reprinted with comments in [Wardrip-Fruin 2003]. ARW crew members during an installation of The Amorphic Landscape. McMurtrie Chico. Artistic Director of Amorphic Robot Works (ARW), a collective he founded in 1991, consisting of artists, scientists and engineers. > The Amorphic Landscape (2000. c). Installation with robots. < Form+Code: In Design, Art, and Architecture, by Casey Reas, Chandler McWilliams and the graphic studio Lust. Princeton Architectural Press, 2011. > Unreal art (2005) Game. Use of video game motors. - Video Brian iPhone / iPod Touch Review. - Quoted by [Berger-Lioret] p. 102. - [Popper 1] p. 129. Original projection techniques. - This construction game has been, mainly from the beginning of the 20th century to the 1960's, a practical introduction to mechanics in general but also to the idea that any mechanism may be built by assembly of standard parts. And so, indirectly, favoured the idea that any information could be represented by an assembly of bits. - Used by Zaven Pare, explicitly showing the machine aspect of his works. - Dozen, if not hundreds of useful links on this Media Art Design page, a gift by Dominique Moulon. Media Lab. See MIT (and for common nouns, media). Medialab. Videos about the history of this French society. > Ashley Madison Angels at Work in Paris (2018). See a description in Data Dating show catalog. > Random Darknet Shopper (2012C). "a bot on a three-month shopping spree in the Darknets where it randomly bought objects like Ecstasy and had them sent directly to the gallery space." Meek Design " I am an information architect, interface designer and developer... Somehow I’ve become a specialist for typography-related projects." Meenal. Painting, mostly "Photoshop" type. > The Seven Sisters National Park Series (2013 c.). > Anamorphosis Series - Untitled1 (2010). < L'art selon André Malraux, du musée imaginaire à l'inventaire général. In-situ, 1/2001. Paris. Melchiot Fabrice. Theater. Manager of Am Stram Gram Theater in Geneva. > Lexia to perplexia (2000). See (Bootz). Menezez Philadelpho. Poet and scientist. [Bootz]. < Le travail créateur. S’accomplir dans l’incertain. Gallimard/Le Seuil 2009. A solid work about Art milieu and market. Mengbo Feng. Interaction. Wikipedia . Works and comments in Mahjong (see China), who writes : "He was one of the first Chinese artists to develop an interest in global networking, the virtual world, and their effects an human behavior. For Documenta 11 (2002) he invented the game Q4U, a perverse multiplayer version of a real war game... Since the early 1990's, he has worked at the intersection bsetween painting and digital media with CD-Roms and video game formats". > Long March (2008) and other works, commented with large pictures in [Lieser]. > Into the City (2004). Menicacci Armando. Dancer. A founder of Digital Flesh. Menkman Rosa. 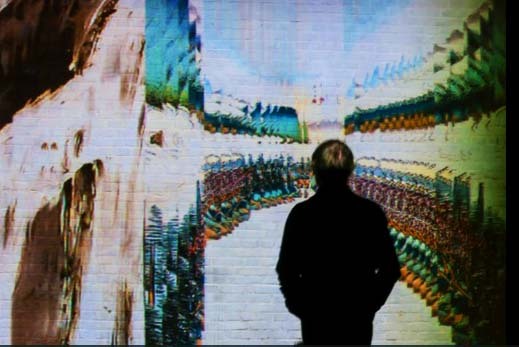 An artist and theorist "who likes to focus on visual artifacts created by accidents in both analogue and digital media. The visuals I make are the result of glitches, compressions, feedback and other forms of noise. Although many people perceive these accidents as negative experiences, I emphasize their positive consequences: I believe that these artifacts facilitate an important insight into the otherwise obscure world of media resolutions. By combining both my practical as well as my academic background, I intend to merge my practice into a grand theory resolution based artifacts (or a study of glitch > A Vernacular of File Formats (2010). webpage. < Arts et nouvelles technologies. Art vidéo, art numérique. Larousse 2011 (First edition 2003). Merg Sacha. Programmer and developer working with Future Farmers. - He has developed online games and his most recent personal project is a visualization tool. See www.sas21.de. > Maximum Security (2002) . Hugo Chavez messages interaction and posting on the walls. [Greene] p. 174. Merlet-Briand Mathieu . Generative painting. > Our cloud are in the #air (2017) "A series of 6 pieces that examine the current illusion report that we have with the use of the Internet and the big data"
> The story of two sacred trees (2016). Webpage. > The Death of the Authors, Anne Frank's collective voice 1945 (2015), by Stéphanie Vilayphiou and An Mertens webpage. 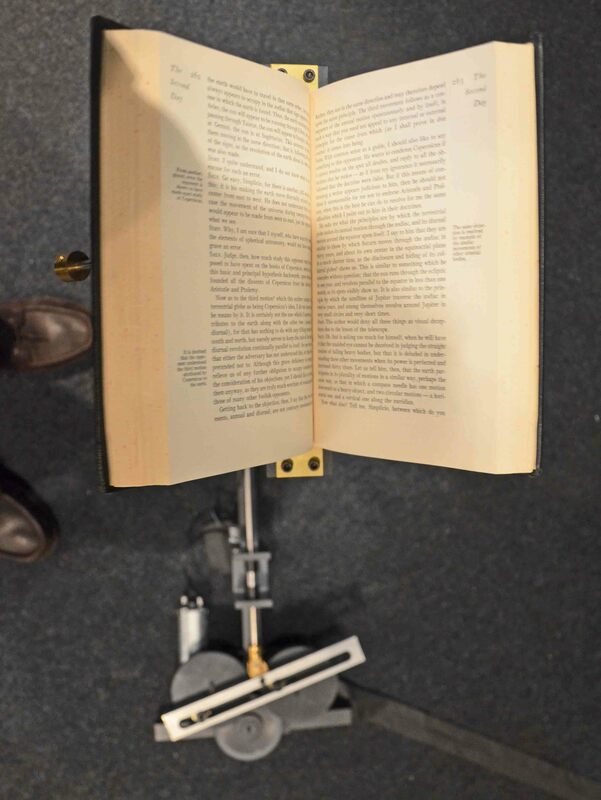 A botopera, Constant, 2015, by Michael Murtaugh, Anne Laforet, Gijs De Heij, Antonio Roberts, An Mertens. webpage. > The Death of the Authors, 1941 (2012) by An Mertens and Femke Snleting. A generative novel, Constant, 2012. Webpage. This piece is also part of virtual collection in Jeu de Paume. Webpage. > Pixels (2014), new creation at Montreuuil. Dance and video projection. > Litanies de la vierge (1461). Site (we are not sure that it is still operational), MSH Paris Nord (Sorry, in French only), Bootz. >Sculptural hall, Mercedes-Benz-Galleries. (2010 c.). with Atelier Margraph. Illuminated walls, LED. Quoted with one picture in [Klanten]. Messaoudi Merryl. Video, games, projection mapping. She founded Crossedlabs a production agency in digital arts. > Pacmanize me (2011). Projection on a mapped building, working with a move sensor. Done with Théoriz. - Interview by Delphine Neimon (Youtube). - One of the first composers to use Martenot waves (according to [Collaer]). < Arts/sciences alliages, by Iannis Xenakis, with texts by Olivier Messiaen, Michel Ragon, Olivier Revaults d'Allonnes, Michel Serres and Bernard Teyssèdre. Casterman 1979. > Feuillets inédits pour ondes Martenot (2003). Video. > Machine variations (2014). With Nicolas Bernier. A large music instrument using wood sticks. > Projectors (2014) . See a video. Sound and images with 2 ancient cinema projectors and a video projector. Mestaoui: What the casual visitor can see. Mestaoui Naziha. One of the founders of Electronic Shadow. Architecture and dance (with Carolyn Carson). > Corps en résonance (2013 c.). Shown at Show Off 2013. 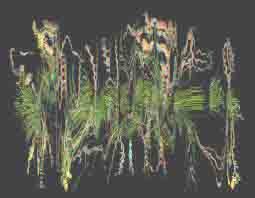 Tibetan bowls generating interactively image and chant. - Video Exchanges between Yacine Aït Kaci and Naziha Mestaoui . Architecture & Design. > Ex-îles (2003) . Interactive networked installation. [Moulon] p. 67 with a photo. Mestaoui: What a good performer can do with the same work. > Echolocalizator (2015 and after). See our post about Siggraph 2017. Mestre Daniel. CRVM (Centre de réalité virutelle de la Méditerranée). Research Director, Centre National de la Recherche Scientifique (CNRS). - Affiliated to the Institute of Movement Sciences (CNRS and University Aix-Marseille II). - Quoted by [Berger-Lioret] p. 178. > Metropolis (1925). Film (1925-26) by Fritz Lang and Thea von Harbou. - Video of a part (many parts on YouTube). Metzger Gustav. Engaged for environment. [Popper 1] p. 48 [Popper 2] p. 39-42. - Video of an interview about his career. Metropolis : Men and machines ! Meunier Albertine Artist working on the issues of Google, Facebook, etc. > Variaton for 7 Angelinos (2014c.). Objects interfacting. < Manigeste Datadada, by Albertine Meunier and Julien Levesque. > My Google Search History (2011). > Tea Time with Albertine (2011). Video of a workshop about hackers. > Au delà de 1m/s (2012). The work scans Internet every minute, and every time "Je pense" is written on the net, a ball is moved. If ever we would stop thinking, the bills would no longer fall. Albertine Meunier : "Internet, do you love me ?" Mexica. Text generator including critics. - Quoted by [Berger-Lioret] p. 51. > Floor Pattern (2012), as above. > Light Music (2004), as above. Meyer Bertrand. Professor at UCSB (Santa Barbara) and ETH Zurich. He is not directly engaged in computer art... if not that his ideas about programming include a high conception of ethics and aesthetic in this activity. The title of his last book, A touch of class, is art in itself. <Object-oriented software construction. Prentice Hall. Republished 1989. < A touch of class. Springer 2009. - Video of Mils award ceremony 2010. - Video of a presentation by a Japanese specialist. > I Photograph to Remember (1991), considered by [Vroege] as the first photographer to make use of a CD-Rom. - The beginnings of "electronic music". The point of view of Paul Collaer (1965). Meyerhold Vsevolod. A multimedia forerunner. > La terre cabrée (1923). Theater with a screen above the stage. Quoted by [Picon-Vallin]. Meyers: Please try this at home (2014). Meyers Raquel. Born in 1977, she works with low-res graphics and photography for performance, web, video, VJ and installations. Currently she works with storytelling in text mode (ascii, petscii, etc) together with Goto80. Lightrhythmvisuals released her collected works in 2010 on the DVD ‘Useless, Yet Crucial’. It shows her characteristic mix of black humor, surreal imagery and low-res - See typewriter art. > Please try this at home (2014). Meynard Jean-Claude. Plastic and fractalist artist. Mainly painting. Not properly digial. - Interview in Créanum, Nov/Dec 2010. Mezei Leslie. Page Atari Archives. Page Compart. > Variations (1970). Quoted by [Couchot 2003] p. 41 . Figurative with deformations. Mézenc Juliette. Writing, Poetry. Blog. Miasnik Shira. Music and other arts instruments. > Project of guitar (2007). Micad. Show/conference organized by par the Micado Association. Changed its orientations in 2006. Michaud Yves . Art critic and philosopher. < Digital art - digital arts. 2 pages in [Worms 2012}. < Critères esthétiques et jugement de goût. Editions Jacqueline Chambon 1999. < L'art à l'état gazeux. Stock 2003. < Epic Mickey (2010). An interactive saga directed by Warren Specotor. (Télérama 11/27/2010). > A new Rembrandt painting (2016), by a Microsoft team. Cited by Manuela de Barros, Le Monde, Oct. 20, 2018. > Tay (2016) . A bot working on Twitter. Wikipedia. > HLSL, High level shader language, for modeling. > Kinect (2010). 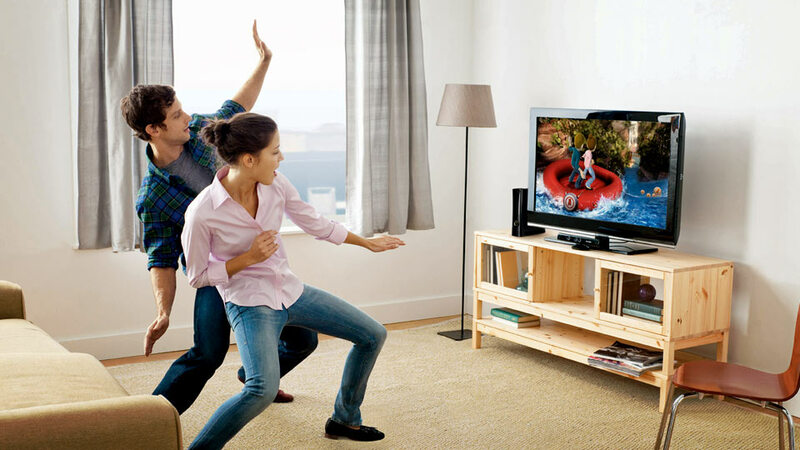 19 millions of Kinect boxes have been sold at may 2012 (Le Monde, june 5, 2012). Quoted by [Berger-Lioret] p. 116. - Jamie Lidell, a techno-soul musician, uses three Kinect in his performance. (Olivier Roy, A Nous Paris du 11/7/2011). 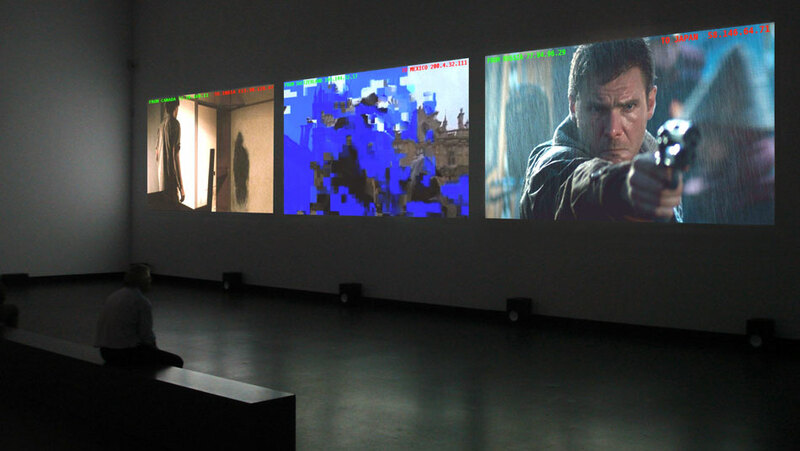 Kinect, by Microsoft : a bonanza for interactive art. - (Video) Oasis Combination with Lego and home devices. - (Video) Why it is impossible to combine several system. - (Video). Combination with synthesis. > XBox (2000 c.) Game engine. MID. An artistic group, quoted by Darko Fritz in [Lartigaud]. No other source about this group. > D (1965). Mixed techniques; Museum of Contemporary Art, Zagreb. Midi-Pyrénées. French region. See our geographical guide. Mignonneau Laurent. see Christa Sommerer. Mignotte Anika. [Couchot 2007] p. 268. Miguirditchian Julie. Co-founder of the producer company Numeriscausa, then of Numeriscausa in 2007. The gallery is now closed. Mihaleva Galina. 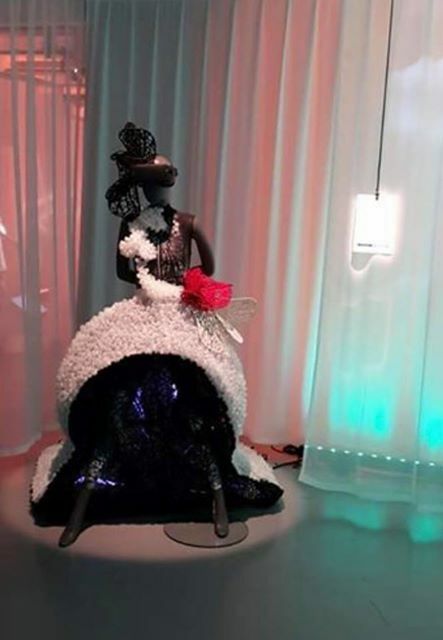 "We, at Galina Couture, aim to give your imagination a new life in the form of artistic fashion. We provide custom-designed dresses individualised to your needs, whether its wedding gowns or day-to-day wear, with customised dresses that are truly and solely yours. Be in the height of fashion luxury with our limited edition collection where we merge art and fashion into indulgent creations." > Tranquilitie (2016). A garment connects to calm environments, and displays the state of noise pollution in the city. < Modèles et données extra-musicales: étude de leur incidence dans le processus compositionnel" in [Pottier]. > Envol (2014). by Ashot and Mamikon Mikaelyan A bronze and copper collar, and an animated butterfly. Commented by [ Aziozmanoff 2015]. Milhaud Darius. One of the first composers using Martenot waves, an ancestor of synthesizers (according to [Collaer]). 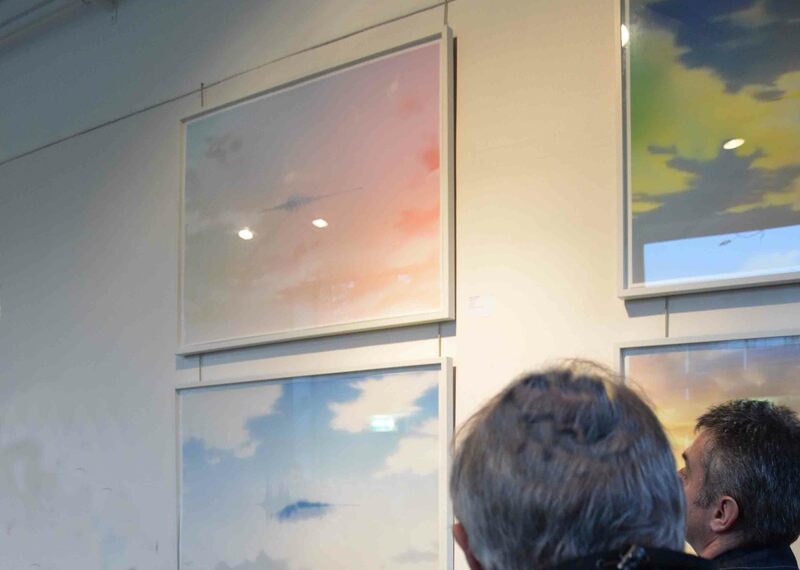 > Bergen Sky (2002) [Greene]. > vlog 3.0 (2000 c.). < Digital Storytelling. A creator's guide to interactive entertainment. Focal Press. First published 2004. Third edition 2014. Something like storytelling Bible (546 pages). Not oriented towards art properly. > White Noise (2009) Video . > Introspection. 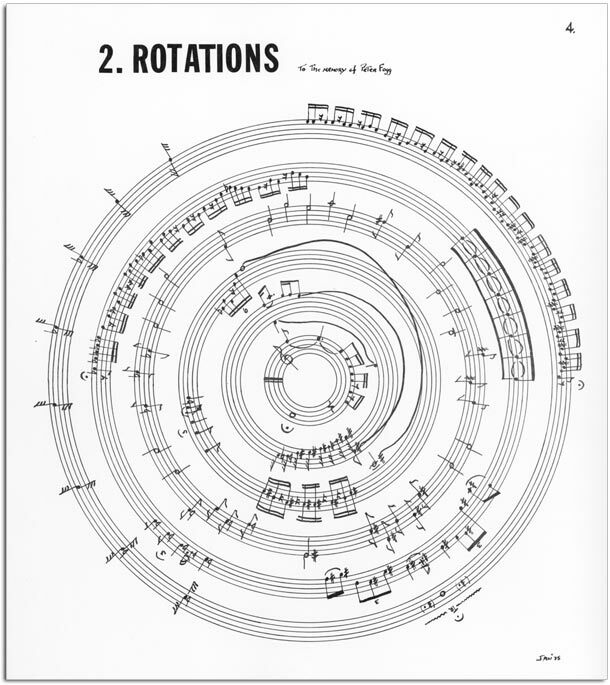 (2006 c.) Siggraph 2006 : Algorithmic musical composition. > Past tense 1. (2000 c.) Digital animation [Wands]. Miller Steve. Sill 2D Images. Millet Catherine. Writer, journalist, art critic (Art Press). - Video of her part in a round table, may 6, 2010. - "Je ne sais pas si je peux me permettre de dire que nous sommes des amis de longue date" writes Fred Forest (in [Forest 2010]). < Artificial intelligence for games. by Ian Millington. Elsevier 2006. > Flora NT (1969) Computer drawing on paper. IBM 7044 computer, Calcomp 565 plotter. Published in Bit International n° 7, 1969, Zagrev. According to Darko Fritz in [Lartigaud]. > Untitled 8 (1978). An image in the Recode project. > Kite form (2006 c.) Siggraph 2006 : Kite form laminate. > Perplex City (2005 c. ) "A city obsessed with puzzles and ciphers. A game that blurs the boundaries between fiction and reality. ". Comments from the transmedia standpoint in [Phillips]. Mineur Etienne. A co-founder and art leader in Incandescence studio. Minh Cuong Castaing Eric. See Shonen. Minh Yann. See special notice. Ministère de la Culture et de la Communication. (French ministry of Culture) Website. - Culture Labs. The ministry supports digital cultural uses by the general public. MIT. Massachusetts Institute of Technology. MIT Press is particularly active, presently (2012), on digital arts and medias book publications. - CAVS Center for advanced visual studies, founded 1967 within MIT. - Media Lab created in 1985 by Nicholas Negroponte based on the research group Architecture Machine Group, is one of the structures in MIT. > Kismet (2000 c.). "Social" robot, due to expressive abilities. - Its main author is Cynthia Breazeal. - [Couchot 2007 ] p. 261. Mitchell Bonnie. Bowling green state university. > Experimental extremism (2000 c.) [Wands] : immersive installation. Mitchell Katie, stage director. Quoted by [Moindrot 2013], pp. 199-200. Wikipedia. > Written on skin (2011). by George Benjamin. > Orest (2010) by Manfred Trojahn. > Al Gran Sole Carico d'Amore (2009) by Nono. Mitchell William J. Professor, architecture, media arts and sciences, MIT. < Me (MIT Press 2003). Video of an intervention about this book. > Mixigloo (2016) by La Villette, installation for children (interactive workshop). Miyazaki Hayao. A manga and animation films author. Wikipedia. .
Plotter use demonstration for a Manfred Mohr, from the Ex Chamber website. Mizuguchi Tetsuya. A game author. - A compelling piece of news by Guillaume Fraissard in Le Monde Télévision du 7/3-4/2011. > Rez (2001) . "A baroque work, inspired by Kandinsky, half way between Tron - the story runs in a computer circuit, as in the Disney 1982 film - and a graphical palette explosion. > Sega Rallly (1990 c.) A game of cars. - Video of a text, date 1930. > Light Prop for an Electric Stage (1923). [Popper 2] 16-17.From 1923 to 1930. < From Material to Architecture (1920) A book quoted by [Grau]. < Peinture, photographie, film, et autres écrits sur la photographie. by Laslo Moholy-Nagy. Folio Essais. First published by Jacqueline Chambon, 1993. Mohr Manfred. Personal page, Wikipedia. - At Art Basel 2013, Bitform Gallery showed a large number of his works. - Algorist, one of the most famed. He based himself on Bense aesthetics. - He put on line different contents for the 40th anniversary of his exposition at ARC (would have been the first digital exposition in a museum). See the catalogue (PDF, 21 Mo). (Indicated par Pierre Hénon). - Video of an interview. > P-701B (2000). Inkjet print (geometrical). 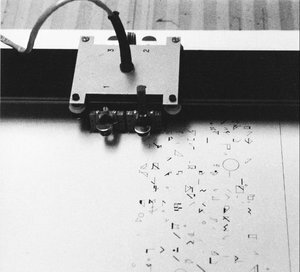 > P-197K (1977) drawing on a plotter. > P-411-A (1990) [Popper 2] 67-69, with a reproduction of the work. > The Cubic Limit Series (1976 or before). See image and reconstituted code in the Recode project. And of several other of his works. > P 163 B (1975). Four drawings on a Benson plotter, quoted with picture by [Lieser] 2015. "I write computer algorithms, i.e. rules that calculate and then generate a work that could not be realized in any another way. It is not necessarily the system or the logic I want to present in my work, but the visual invention that results from it. My artistic goal is reached when a finished work can visually dissociate itself from its logical content and convincingly stand as an independent abstract entity" (in [Wands]). [Processing]. - Commented by [Couchot 2003] p. 40. - Works in Victoria & Albert Museum. < Transhumanités. Fictions, forme et usages de l'humain dans les arts contemporains. by Isabelle Moindrot and Shin Sankyu. L'Harmattan 2013. < Brera Academy Virtual Lab. Un viaggio dai mondi virtuali alla realtà aumentata nel segno dell'Open source. by Giampioro Moioli and Mario Gerosa. Francoangeli, Milano, 2010. > Mojo (2006) Landscape generation software. 2006 for the version 3. - Video of an animated landscape. - F.K. Musgrave dedicates it a full chapter in [Ebert]. Moles Abraham. A precursor, philosopher of quantitative aesthetics (shannonian). < Arts et ordinateur. Casterman 1971. Republished by Blusson, 1990. > Human Sensor (2016). A sensor analyses air in a respiratory mask, combines these data with the wearers breath, and modulates a swarm of color LEDs. When a sign of pollution is detected, the lights turn red. Molnar Vera wikipedia Personal site. A pioneer in algorithmic art, still active in 2010. Works at Yia in 2016. - Video of a film about Vera Molnar. > Comment faire sortir le caré de ses gonds ? (1988). [Popper 2] 64-67 shows a picture. < Le système Molnar, une approche, in Véra Molnar, by Vincent Baby. - Quoted by [Couchot 2003] p. 40, [Berger-Lioret] p. 64. Two pages [Meredieu]. - Works in the Victoria & Albert Museum. See an image in the Recode project. > (Des)Ordres (1971C) drawing, quoted with picture by [Lieser] 2015. > Untitled (1969). Quoted, with several works, in [Lieser] with pictures. Molyneux Peter. Video games designer. Wikipedia. Works in a Microsoft Studio. > Fable III (2010). A chapter in [Rose] : "The emotion engine" . Uses Kinect. > Smoke and Hot Air (2007). Network installation. [Moulon] p. 68. In cooperation with the sculptor Robin Mandel. - Video of a digital presentation. > Le monde des matériaux (1990 c.). The Paris ACM Siggraph page. Mondrian Piet. An abstract painter. Many programs have simulated his style. > Monet 2010 (2010). Interactive on line game for young people introduction to this painter Monet 2010. Thelonius Monk: serialism inspired jazz. Mongrel. A group of artists, mainly : Graham Harwood, Matsuko Yokoji. Many quotations and pictures in [Greene]. > Uncomfortable Proximity (2000), by Harwood. > Rehearsal of Memory (1996). CD-Rom. Self-definition : "Mongrel is a mixed bunch of people, machines and intelligence's working to celebrate the methods of a motley culture. We make socially engaged culture, which sometimes means making art, sometimes software, sometimes setting up workshops, or helping other mongrels to set things up. We do this by employing any and all technological advantage that we can lay our hands on. Some of us have dedicated ourselves to learning technological methods of engagement, which means we pride ourselves on our ability to programm, engineer and build our own software, while others of us have dedicated ourselves to learning how to work with people. Mongrel sets up strategic alliances to expand and contract. Monk Thelonious. "Les harmonies vitreuses d'un Thelonious Monk présentent parfois des nuances assez schoenbergiennes ..." (Alex Ross, The rest is noise, Actes Sud 2010). - Artificial art paintings. Exposition in 2005-2006 at Museum d'histoire naturelle de Tours. The Catalog can be bought on line. Monnier Richard. Sculpture, and some image processing research. > Rayons (2002). A small experiment with image generation. 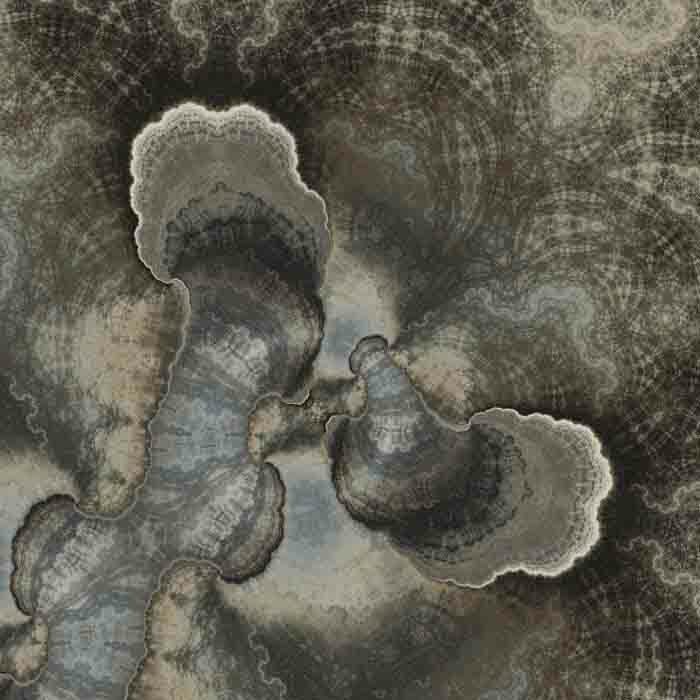 Samuel Monnier: 20120227-1, 2012, unique image, inkjet or Archive paper (seen here under low res). < Mondrian. Fractal (2012 c.) Shown in Laval Virtual. < Mondes algorithmiques. A book, self-published, 2008. Monos John . 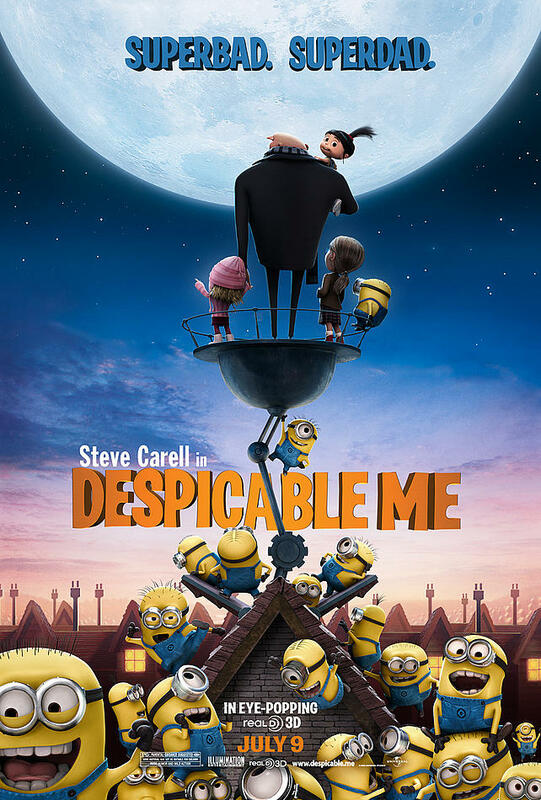 IMDB, the Internet Movie Database. Special effects. On a Falmouth website we can no longer find: " Daro Montag makes art with living matter. His research and creative practice start from the premise that the natural world is best understood as being constituted of interacting events rather than consisting of discrete objects. This philosophical position foregrounds the significance of process and its residue. To express this idea in visual form he is particularly interested in the notion of indexical traces. In order to create this work the artist has employed the assistance of micro-organisms, plants, insects, toads and other living matter. His most recent work, commissioned for an exhibition at the Met Office, records the activities of the wind and rain." Montagné Jean-Noël. President and founder of Art sensitif Association for the promotion and development of experimental electronic arts and interaction arts. > Eden (2013). Fragmentation assembly of photographs and paintings, and finally synthesis using a computer and printing on paper. Monteiro Stephane. Music and systems. 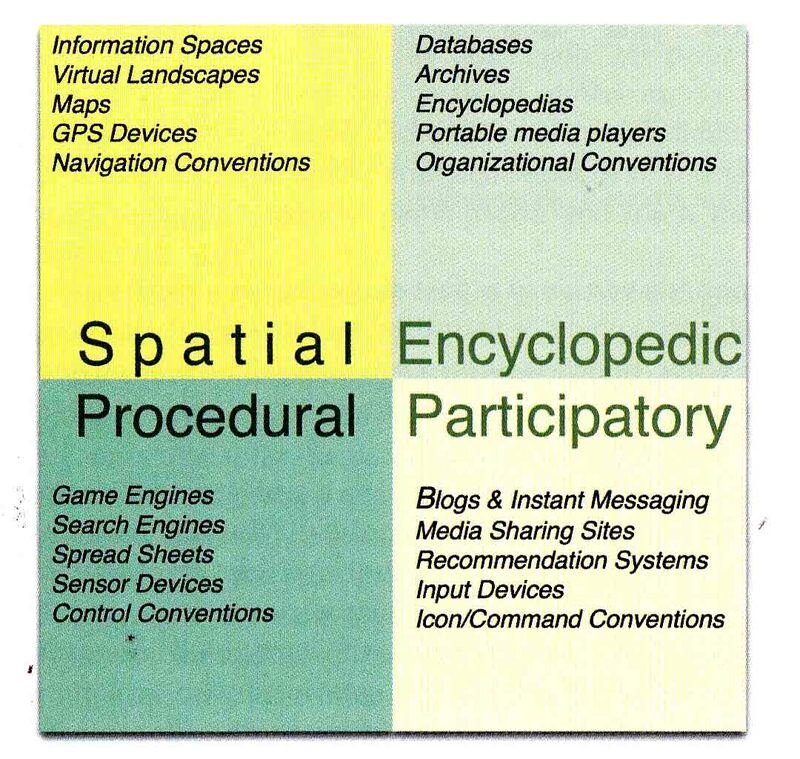 > Implementation (2004), with Scott Rettberg. A "sticker novel". The authors distribute texts on the net, and the participants stick them at interesting points. < The New Media Reader. Ed. by Noah Wardrip-Fruin and Nick Montfort, with introductions by Janet H. Murray and Lev Manovich. MIT Press, Cambridge Mass and London, 2003. < Twisty little passages. An approach to interactive fiction. by Nick Montfort. MIT Press 2003. Montgermont Nicolas. See Art of Failure. - Vivariou (2013c. ), in duo with Cyrille Henry, ChDh. Montiel-Soto Sabrina. Co-founder of Calvacréation group. > Butterflies, Species at Risk at the Edge of Reason (2011-2013). The book opens and close slowly. > Little Ripper (2011) . Directed by Celeste Potter for XYZ studios, Little Ripper forms part of the feature length documentary Fast, Feathered and Fearless by Streamline Media. Moore's involvement in the project included all modelling, texturing, 3D animation and compositing > Stories of the Seas (2008). Moore Gordon . See our paper about this law. - Quoted by [Berger-Lioret] p. 39, 115. > Pixillation (1970), in cooperation with others. Tomm Moore . See our post about Craft. > Brendan et le secret de Kells (2010C). < The producer as a composer. Shaping the sounds of popular music. MIT Press 2005. A fascinating book, as far as we know, unique in its genre, not only about producers, but also about pop music at large evolution since the 1950's. Somehow, it is an exact complement of The rest is noise de [Ross], which deals mainly with highbrow music. > Modern Devil (2015C) . Matte painting. Morawe Voker. Member of Fur. - Show, with Alain Le Boucher, Spring 2013 (we comment). Moreau André. Cyberartist according to [Couchot 2007] p. 234. Moreau Benjamin. A co-founder of Kolkoz group. Moreda Miguel. Myspace page. A film maker. Morel Julie. A member of Incident.net group. < Le E dans l'autre (2009). Rereading Senecas's Oedipus and proposing a crypted version, with a constant sweeping of letters on video, algorithmically generated. < My life is an interactive fiction, A selection of textual interactive works, by Julie Morel. Texts by Olivier Belhomme, Camille de Singly and Damien Simon. Published by Résidences de l'Art en Bretagne 2011. Morellet François. A member of Grav. See Wikipedia. - Exposition in Centre Pompidou , 2011. - "A major actor in geometrical abstraction during the second half of 20th century and a precursor of minimalism" (Wikipedia). - Quoted by [Berger-Lioret] p. 35. More in French. > Futur dream (2016) Digital ink. Morelli Patrick. In1999, he created with Alain Longuet the daily page "Le crépuscule des jours", still active (on 26/10/26/2010). < Théâtre et nouvelles technologies. Edited by Lucile Garbagnati and Pierre Morelli. Editions universitaires de Dijon 2006. Moretti Pierre. Writes the theater show Equation pour un homme seul, using the Rephrase software by Baudot. Mori Mariko. Photography and digital techniques. Wikipedia. Quoted by [Quaranta] p. 22. Morice Anne-Marie . President, Synesthésie. Moricet Bertrand. Music, instrument design. A member of Orkestronika group. Morie Jacki. Virtual Environments. Academic research page. > Scan_V1 (2011) Sculpture and video. > Leçon de piano_V4 (2002), up to 2011. Video and music, projection and a piano. Presented within "Québec Numérique" at Gaité Lyrique, Paris 2012. Morinaga Kunihiro Designer. Brand Anrealage. > Reflect (2015). A photosensitive fabric gets colors appear only under the flash of the public smartphones. Morisset Vincent. Director, programmer, inventor, he is looking for new ways to tell stories across all platforms. Moriyama Tomoe. Siggraph 2006 : Presentation : Meta-Visual/Media/Space-Algorithmic "Intersection". Les morphogénistes. A French group of digital artits: Virginie Bizard, Julien Castet (president), Arnaud Dubarry (computers), Sophie Itey, Anne-Charlotte Labro, Joseph Larralde, (mjuic) Olivier Martin (music) and Charles Rèches (computers). > City Ruins (2010). Developed explanation of its making-of in 3DMag 1-2/2011. A score by Dexter Morrill, from his website. Mostafa Magdi. Music, sound, multimedia. One page in [Dermineur]. < Vers la cité hypermédiate. Du modernisme fossile à l'hypercité immédate, by Jean-Magerant and Elisabeth Mortamais . L'Harmattan 2003. AH No 127 (concepts). > Anti-Horário (CounterClockwise) by Gisela Motta and Leandro Lima. Mouchès Philippe. Painter. Theorist of Divisionnisme Périgourdin. A member of Oupeinpo. Page in Vents contraires. - Divisionism may be considered a first phase of digitization. See our note about fragmentation. Mouchette. An avatar on the Web. > Mouchette (1996) [Greene] pp. 114-115 with a picture. Quoted by [Lieser] with a large picture. Mould Trina. Pseudonym of Rachel Baker. Moullet Patrick . Experimental music, instrument sculpture. In particular Omni. - Video of a concert in 2008 with Marie Menges, Elise Dabrowski, JB Meier, Thierry Hochstätter (City Percussion). Light and light kinetics by Laurent Bolognini. < Eduardp Kac, by Dominique Moulon. Cendre des arts d'Enghien (France) 2011. < Life, Light & Language. Fifty questions for Eduardo Kac; an interview by Dominique Moulon. Centre des Arts, Enghien 2011. Moulton Shana Mainly video, but with a lot of computing. > Victory Garden (1991). Presented by [Bootz]. Diks, for Macintosh See History of Computer Art, by Thomas Dreher. - Quoted by [Quaranta 2013] p. 5. In 2013, senior curator of The Utah Museum of Contemporary Art. < L’informatique en France, de la seconde guerre mondiale au Plan Calcul. L’émergence d’une science. Presses de l’université de Paris-Sorbonne, 2010. Nothing about art, but an essential book to understand the birth and youth of the computer discipline in - Quoted by [Berger-Lioret] p. 33. Mount John. Genetic art. Carnegie Mellon University. 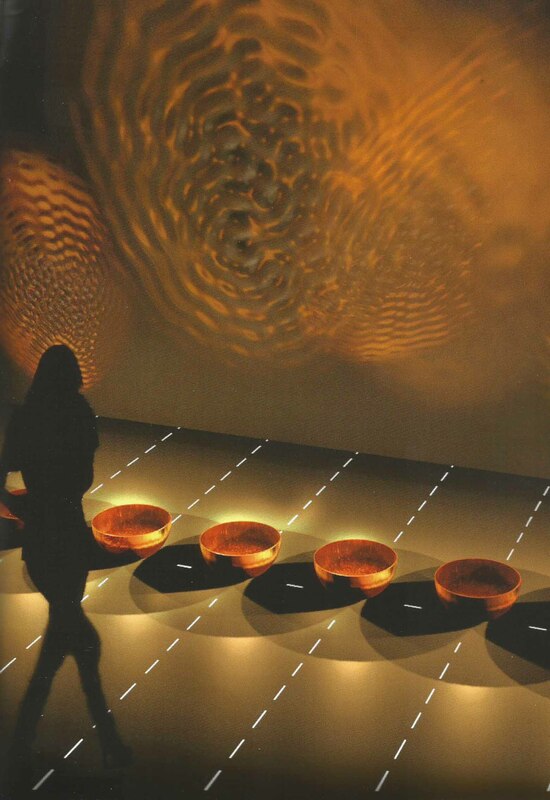 > International Interactive Genetic Art (1997 c.). Project letting web users to act collectively as artistic selectors. - Quoted by [Berger-Lioret] p. 66. 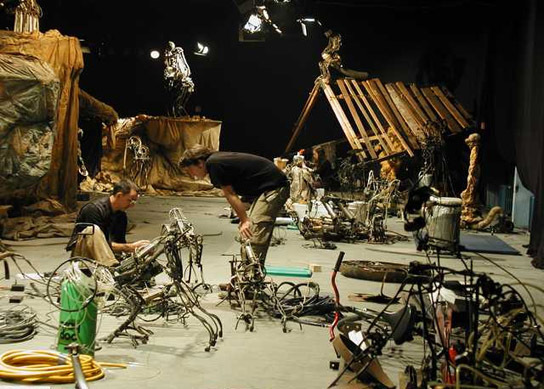 > RAP (robotic action painter (2006) . Environment perception et reactive/random behavior. - Quoted by [Berger-Lioret] p. 80, 134, 140. Mourles Pierre . Musician, choreographer. > The augmented accordion. (2010 c.). An instrument, but he uses it to play. Example on Dailymotion. Moving Stories. A research project about narrative modes. Mozart Wolfgang Amadeus. He used random techniques in some compositions (1787). - See Vienna university site. > Musicalisches Wülferspiel (1787). [Edwards] gives an illustration. - Quoted by [Berger-Lioret] p. 21. MTAA. Artistic tandem, with Mark River and Gim Whidden [Greene]. Wikipedia. > Random Access Mortality (2002). A mix of cuts from songs. > Mudbox (2005) Software tool for digital sculpture. Mukendi Jean Katambayi. See Katambayi. 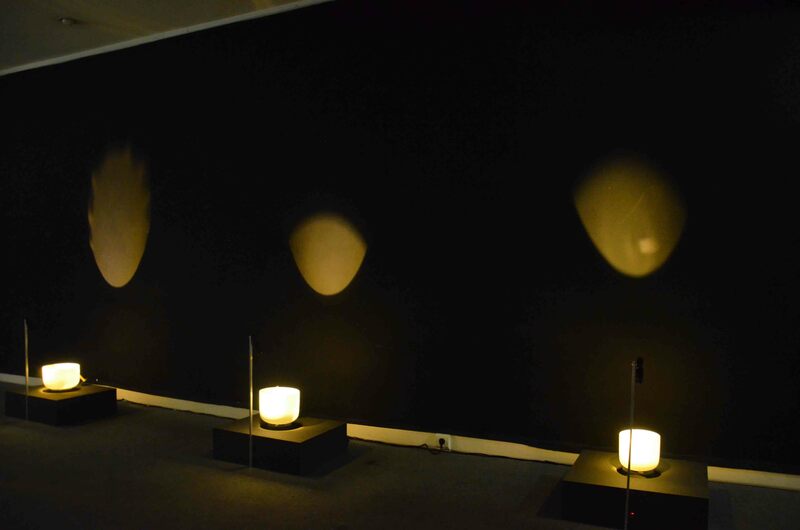 Geert Mul: San Shui, interactive installation. Mul Geert. Media artist, he explores "the possibilities of generating visual poetry by re-combining images from collections and databases in video’s, photographs and installations... He l is designing a data-based methodology of acquiring ‘ knowledge’ in the form of experiences, associations and visual poetry, trough intuitive and playful interaction with a databases and archives. He regards the database as a way to perceive things; a databased perception, which defines contemporary culture at > San Shui (2013). Interactive installation. Mulfinger Jane. with Graham Budget. > Regrets (2005). Urban performance and website [Moulon] p. 30-31 , and a picture. > Poetry on the Road (2002) until 2007. With Florian Pfeffer. Visuals for the festival Poetry on the word. Painting + text. 4 pages with pictures in [Bohnacker]. > For All Seasons (2004) Site . See [Bootz]. > Blind Genes (2002). A mix of photographs and typography.[Paul]. > Scores III (1998). [Paul]. Muller Tomas. Mainly matte painting, it seems, until Point Cloud. See his Balance.netpage. Multimedialab. Website for the tutorials given by Marc Wathieu, Digital Artsat l'ERG (École de Recherche graphique) in Brussels. Munari Bruno. A Futurist painter. 1907-1998. - Quoted by [Grau] p. 38. > Maquila Region 4 (MR4) (2010). Cited with picture in Artpress2 Art in the digital age, May-June-July 2013. > On Translation: Social Networks (2006à . 6 pages in [Algora]. > The file room (1994) Jeu. [Murray] , [Paul] : the game, quoted also by [Moulon] who comments " an art project fully around data bases". In 2015, the work is shown at Futur en Seine (see our post, with the catalog). Murail Tristan. A music composer. Page Brahms. > Sables (1974) evolution towards the pure drawing. 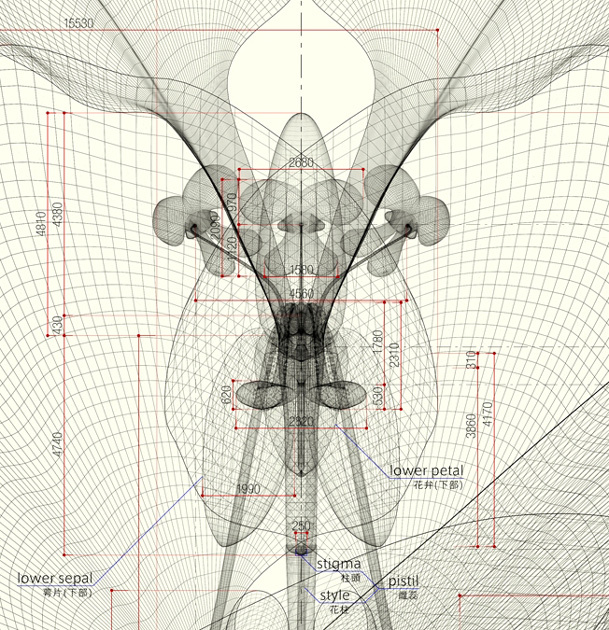 Macoto Murayama: technical accuracy combined with Japanese elegance. > Teo Planet (1995). Behavioral art, with a very sophisticated "screen saver" [Aziosmanoff]. Murakami Takashi A plastici artist . Wikipedia. - Galerie Blum & Poe. > Superflat Flowers (2010). Sculpture, carbon fiber, steel, acrylid and Corian-base. Quoted with illustration in ArtPress2, May-July 2013. > Phalaenopsis Sogo Yukidian (2017). Digital print. < 3ds Max Bible. (republished each year, it seems), Wiley 2008 and following years. Murie Fred. A multimedia artist. In 2013, an interactive work, done with Flavien Théry. > Oracle (2013). A screen displays noise. When a spectator touches it, messages appear. < Inventing the medium. Principles of Interaction Design as a Cultural Practice. MIT Press 2012.It is an "humanistic enquiry", which "accommodates multiple frameworks of interpretation". Murray considers that all media converge into a single medium : "... I argue for the advantage of thinking of digital artifacts as parts of a single new medium, which is best undertook specifically as the digital medium, the medium that is created by exploiting the representational power of the computer". We remain rather skeptical about such a convergence, as we will explain in our transmedia note (to be completed at end of 2012). We are also quite doubtful about her analysis or the digital medium through a a four squares grid : spatial, encyclopedic, procedural, participatory. See illustration. - The New Media Reader. Ed. by Noah Wardrip-Fruin and Nick Montfort, with introductions by Janet H. Murray (Inventing the Medium) and Lev Manovich. MIT Press, Cambridge Mass and London, 2003. < Can you Dig/it? (2010) : preface for The Dump, a book by Maurice Benayoun. < Digital Baroque. New media art and cinematic folds. University of Minnesota Press 2008. > Bindigirl (1999) website co-founded with Jeff Gompertz. "Série de tableaux multimédia". [Greene] p. 112-115 with screen captures. .
> Noemi (2002) [Popper 2] 239-241 shows a picture of the work being used (dynamical) ! Pya Myrvold explaining Video Mount. Musgrave Ken. Algorist. Algorithmic art. - Dr Mutatis. Rendering software tool. Mutagen. Generative tool by Nick Gaffney. Mutator. Generative tool by William Latham. Mutek. 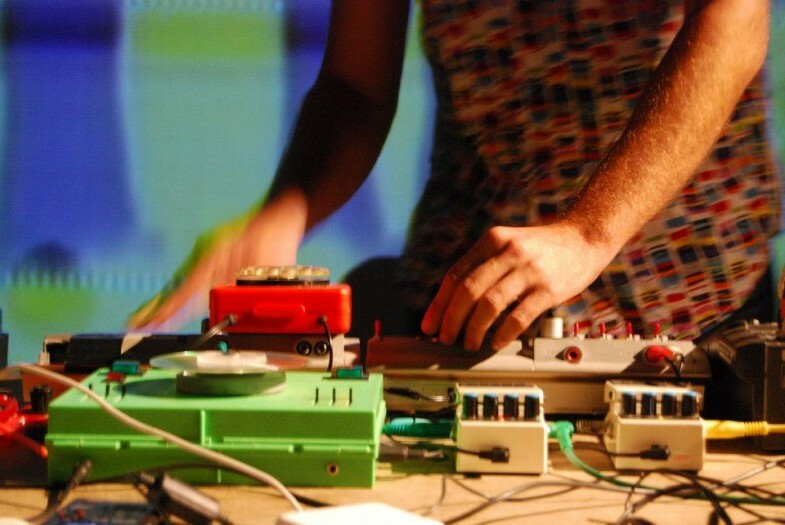 An organization dedicated to emerging forms of digital creativity and electronic music. Its main activity is the Mutek Festival. Muzak. 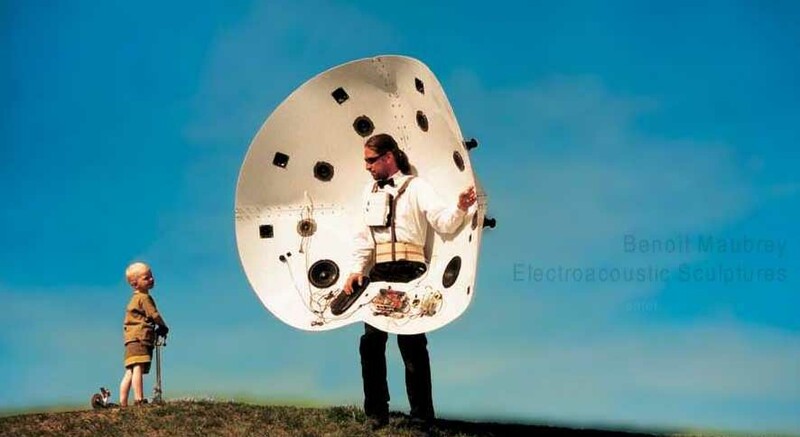 Ambient music, as an industrial material. Said also "Elevator Music" (Wikipedia). - Comments in [Leloup, 2013] pp. 62 sq. > Rob-Art (1985 c.) directly inspired by Aaron (Cohen). - Quoted by [Berger-Lioret] p. 65,66. Pia Myrvold: Avatar at Centre Pompidou, Paris (2014-15). Myrvold Pia "Since the early eighties, Pia Myrvold ́s work has been rooted in interdisciplinary art, painting, sound, video and new technologies. 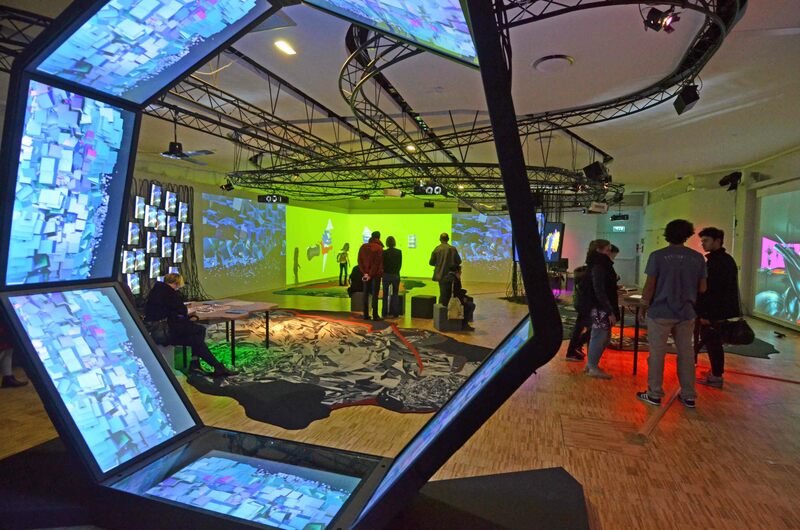 For the past 20 years Myrvold has been one of the first artis ts in Europe to work with interactive art interfaces as part of the new develo_pment in art". > Wands (2015) . Dynamic sculptures. > Hybrid Love (2015) I, II and III. with Théoriz. Dancing robots with fancy dressing. - A synthesis of her oeuvre (1994-2014) on Vimeo. > Art Avatar (2014). Immersive installation. Our post. - Her shows in late 2014. > Art Avatar (2014). Immersive installation. > The Metamorphoses of the Virtual (2013). Installation. A second edition in 2014.